A whole generation is in trouble in South Sudan. The world’s youngest country has been devastated by civil war and extreme poverty which includes famine, disease, trafficking and the loss of schooling which effects almost 6 million children. In the north and central areas, famine has been declared by the United Nations. An Integrated Food Security Phase Classification report estimates 4.9 million people (42 percent of the population) have severe food insecurity, meaning inadequate access to food and that the situation will continue to deteriorate through July 2017. More than 1 million children are acutely malnourished, and approximately 100,000 people are at immediate risk of starving to death. 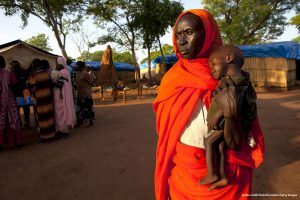 The U.N. and other aid organizations are calling for immediate assistance to avert an even greater humanitarian crisis. Families have exhausted every means available to survive. The people are mostly farmers and agriculture has been disrupted by war. Their livestock has been lost along with farming tools. For survival, the people have relied on whatever plants they can find and fish they can catch. It has been estimated that there were a quarter million deaths, half of which were children. A delayed response by the international community was shown as a partial cause for the high death toll. The UN’s Children’s Emergency Fund Executive Director said that time is running out for more than a million children, however, there are still many lives that can be saved. 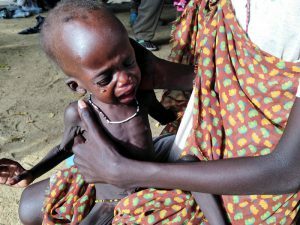 We must not repeat the tragedy of the 2011 famine. The Lost Boys Center for Leadership Development is placing on hold plans to raise money to build a training center within the already built wall and gate in Juba, South Sudan. 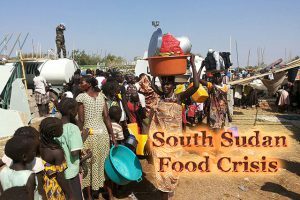 Instead, we are focusing on joining with a humanitarian agency in South Sudan to help supply food and water to the desperate people there. Another project important to the Lost Boys Center is working with the Sudanese children of former Lost Boys who are living in Phoenix, AZ. We have programs where we educate the children on what life was like for their parents as Lost Boys both in Africa and life in the United States. 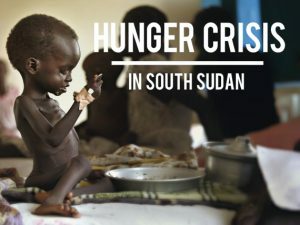 Also, it is part of our project to teach the children on what is going on South Sudan today both with the war and, also, with the famine that is now devastating the people. The Lost Boys Center, 701 N. 1st Street, Upstairs, Phoenix, AZ 85004. 100% of all donations received will go towards supplying aid to South Sudan or working with the Sudanese children in Phoenix. please contact us: by email at www.lbcld.org or phone: (602) 262-2300. .We appreciate your interest in the Lost Boys Center and in the people of South Sudan. They need help now more than ever before. Thank you.